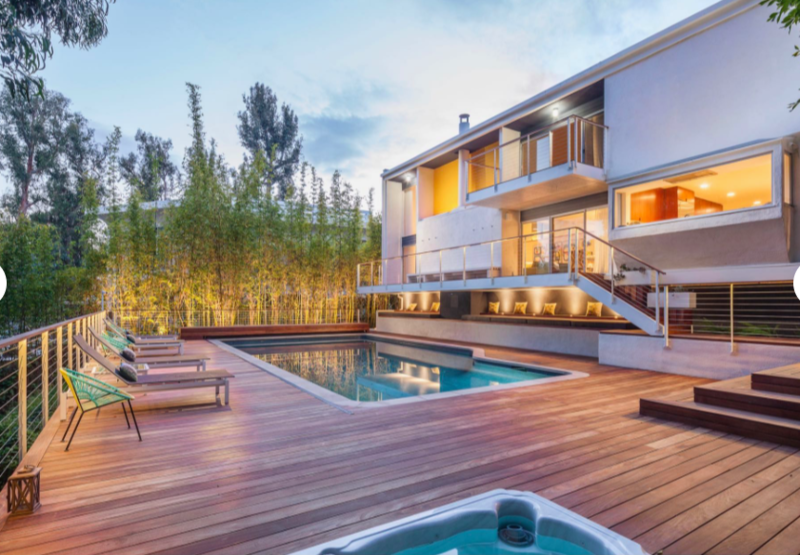 A gated, ficus-lined drive leads to a pristine white stucco and glass compound overlooking a forested arroyo. Originally designed in the Bauhaus tradition by Romanian expatriot Haralamb Georgescu, the current house has been totally renovated by architect Kurt Krueger. The 2-story living room is flanked by back-lit hearth and overlooked by two mezzanine rooms, one a den, the other a study or library. The new kitchen and family room provide direct access to a dining terrace which steps to a yard-sized deck embracing a pool, spa and covered lounge The master suite lies on the second level with bath and an adjacent guest bedroom and bath. Two additional guest bedrooms and baths. Standing apart from the main house in its own private garden, a new glass pavilion with bathroom and cooking facility serves as a guest house, work room, gym or office. Surrounded by sculpture, mosaics and majestic trees, the property whispers serenity, privacy and convenience.